Matt concentrated his study on pre-law courses while in college at Ohio University where he excelled academically and received a degree in Legal Communication. Matt was then awarded a full-tuition scholarship to attend The University of Akron School of Law from which he received his Juris Doctor. Matt represents clients in many different types of personal injury cases, including motor vehicle accidents and dog bites. 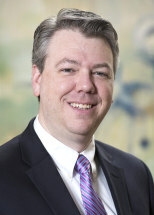 He is currently a member of the Ohio Bar Association and the Akron Bar Association. While in law school, Matt worked at an insurance defense law firm as a clerk, then as an attorney after passing the bar exam. He now uses the knowledge and training he gained during his years working with insurance companies to benefit our clients. Matt prides himself on his willingness to fight for the rights of the injured. When he is not working hard on behalf of his clients, Matt loves spending time with his family and is a devoted husband and father. The 39-year-old Plaintiff was killed in a motor vehicle accident after the Defendant went left of center. Client, age 59, suffered severe and permanent injuries in a motor vehicle accident where the Defendant’s semi-tractor trailer went left on center while rounding a curve in the road on a two lane highway. The entire left side of the client’s body was crushed as a result of the impact. His injuries included a head injury, fractured facial bones, a punctured lung, multiple broken ribs, lacerated spleen, and shattered elbow and knee which required numerous surgeries. As a result of his injuries, he was unable to return to work. Our client suffered cervical disc herniation, which required surgery after the driver of a tractor-trailer turned in front of the Victim’s vehicle, causing a collision. Client had severe lacerations and fractured foot due to defective lawn mower. Client was struck from behind by the defendant while riding her bicycle. Client suffered fractured ribs, a lacerated liver, a fractured leg, a fractured vertebrae in the spine. Client was injured when the other driver failed to yield the right of way and turned in front of client. Client suffered multiple fractures to her legs and arm as well as a ruptured spleen. Client injured due to negligent store owner for failing to clean spill on floor. Client suffered fractured neck and fractured hip. Motor vehicle accident where defendant went left of center hitting client head on causing fractured ribs, torn ligaments in the knee and two fractured ankles. Our Client was rear-ended by a tractor-trailer, which forced the Victim’s vehicle off the road. Our Client suffered a severe concussion, brain bleeding, back and neck injuries. Client was injured in two automobile collisions that occurred one right after the other resulting in a fractured leg that required surgical repair. Client injured as passenger on bus, when bus driver unnecessarily swerved. Client suffered torn ligaments in knee. Plaintiff was involved in a motor vehicle accident and suffered a fractured skull and concussion. Client injured when other driver came left of center striking client head on. Client suffered fractured shoulders and severe lacerations to the head. Defendant failed to yield at a stop sign and crashed into the Plaintiff. Plaintiff suffered a crushed right arm, hand and wrist, a concussion, neck and back pain and facial lacerations.